It is almost a certainty that former hired assassins have limited knowledge of appropriate titles. On the other hand, I, for one, am not going to tell Maxwell Magillicuddy that he should, indeed, second-guess ‘Kebab Your Lamb and Other Stabby Recipes’ now that he’s turned his attention to, let us say, other victims. If he could stomach a dose of vegetarianism, ‘Coleslaw Your Carrot and Other Grating Recipes’ sounds so much less threatening, don’t you agree (unless you’re a carrot, or the friend or relative of a carrot – apologies to all long, orange vegies)? This entry was posted in Variety Show, Workplaces and tagged animals, camera person, cartoon, celebrity chef, comic, hired assassin, interviewer, lego, minifigure on November 28, 2018 by Jay Verney. You may have heard rumours that the aquatic life on Mars is less than satisfactory. However, I’m here to tell you that, but for a little dust storm every so often, the fishing is extratunaordinary with bells and whistles, and an occasional crabby crustacean. Soon enough, Hale crater will be invaded by reckless teenagers from other, less salubrious (read extinct) water flows and I’ll be forced to seek out new life and boldly go, or go boldly, down the avenue. Meanwhile, well, meanwhile, stay a while, and doze in a daze. When the time comes, you may hitch a lift with me in the PeskyCATarian-mobile. 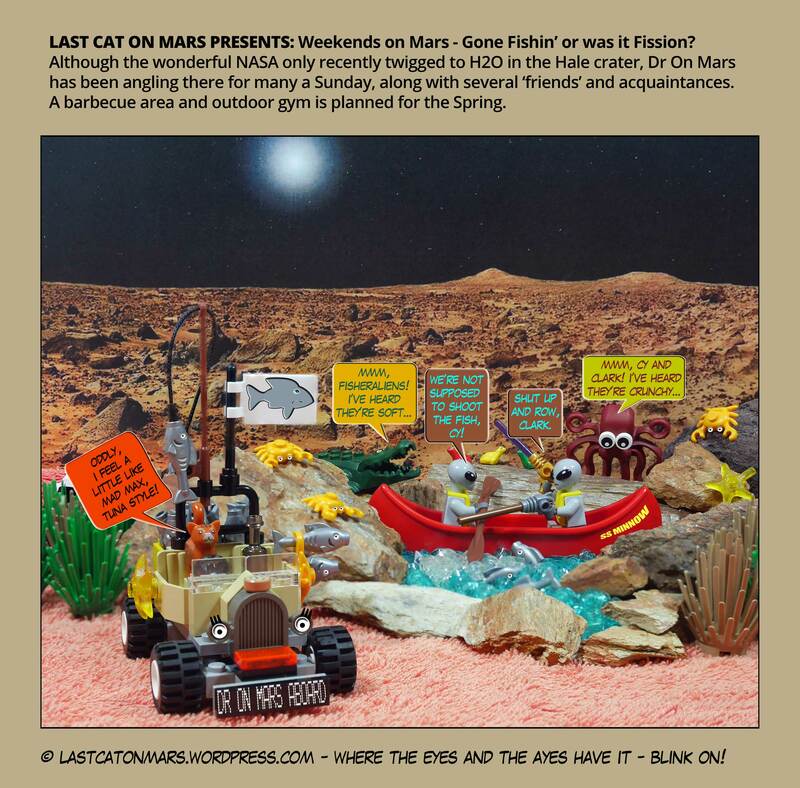 This entry was posted in Space and tagged aliens, animals, cartoon, Dr on Mars, fish, Hale crater, lego, minifigures, NASA, space, tuna on August 3, 2016 by Jay Verney. Are we there yet? Are we there yet? Wait, yes, it’s over for another year, and Chris Froome has won. Again. For the third time. In a row. Deja vu all over again, or what, fellow cycle people, or not? I watch it for the recipes, as I’ve mentioned many times, which is just as well, because at least they change from one year to the next. And I’m hoping that there’ll be a lovely and luscious tuna bake from Dusseldorf, home of 2017’s Grand Depart. It is, after all, a city on a river (the Rhine), so there must be tuna around there somewhere. Meanwhile and P.S., thanks to John Mortimer, creator of our beloved Rumpole and the unforgettable ‘Chateau Thames Embankment.’ Cheers. 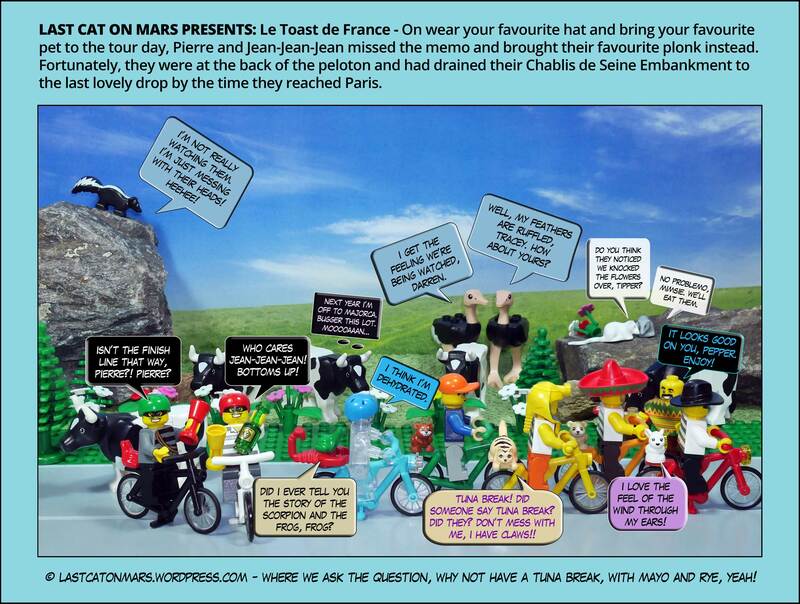 This entry was posted in Special Occasions, Variety Show and tagged animals, bicycles, cartoon, cat, comics, cows, lego, minifigures, ostriches, tour de france on July 27, 2016 by Jay Verney. Last Cat On Mars Presents: Where Do Ideas Come From? There are nine – that’s 9 – creative ideas currently at large in the world, up from 7 a mere twenty years ago. I think the Interwebz have had a little something to with that relatively large increase in the numbers. I’d work out the percentage, but I keep running out of toes. The trick with the Super Nine, as they’re called, is in how an artist decides to use them in ever more ingenious and You-Tube-Virally ways. Modest though he is, credit is certainly due to Burly Barry McBardly-Bard for his enormous contribution to all things artistic, and recycled for that matter. And his great big orange truck full of, er, stuff. Her name’s Performia Faultymuch, by the way – the truck, that is (of the Somerset & Maugham Faultymuches, whatever that means). Keep an eye out for Performia (if your eyes are that acrobatic) in your street. She gets around, you know. 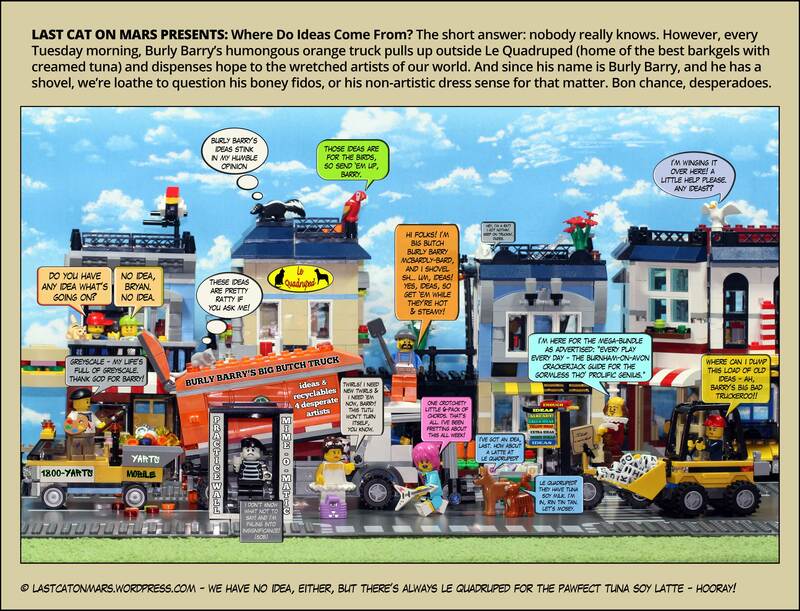 This entry was posted in Literary and Literal and tagged animals, artists, ballerina, cartoon, comic, ideas, Last Cat On Mars, lego, minifigures, rock star, Shakespeare, truck on May 30, 2016 by Jay Verney. Last Cat On Mars Presents: Was it all for naught, nought, or are we just cross today? LEGO®, the LEGO logo, the Brick and Knob configurations, and the Minifigure are registered trademarks of the LEGO Group, which does not sponsor, authorize or endorse this site.